What is Busk Break? The short answer is that it’s an ongoing series of field recordings of street musicians an performers, mostly based in Asheville, NC. The project started in late 2009 as a way to test out a new audio recorder (my trusty Zoom H4n) and continues today as a video-oriented documentary series. The goal is to document street music of all styles, and to showcase the often-astonishing talent of people performing for little more than pocket change and a flash of appreciation from a passing crowd. There is something endlessly captivating about watching street performers. These are people who have, in many cases, spent most of their lives learning the arcane skill of playing an instrument and finding their own creative voice with it. Not all of them are rock stars, but all of them are brave. You have to be. They are braving the indifference, and even hostility, of crowds in the hopes of some kind of validation, either in the form of applause or coins. Many are talented enough to do this for a living (and some do, actually), but perform for other reasons. For the record, I’m not a musician. I’ve spent my professional life as a writer and editor (and, to a much lesser extent, multimedia-content creator). My role here is to document these performers in their brief moments on that expansive stage of the city street. It’s something that is as foreign to most of these musicians as tuning a cello would be to me. If I do my job right, there’s at least one record that these people were here, and that at least one person thought what they were doing was interesting enough to document and share with the rest of the world. I do mean the rest of the world. Since the project began in 2009, Busk Break has found fans all over the globe. 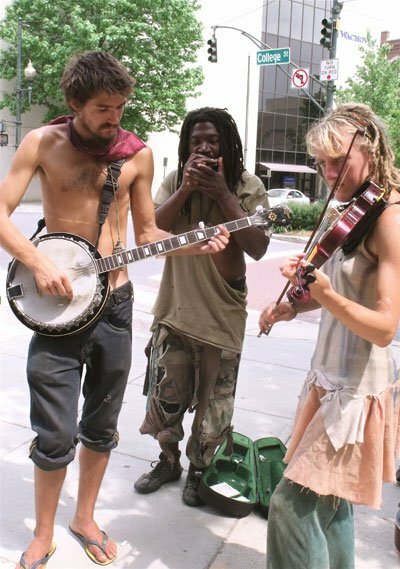 Nearly 40% of the traffic from the YouTube, Facebook and website comes from outside the U.S. It’s not an uncommon thing for me to encounter new buskers in Asheville who decided to come through town specifically because they’d seen a Busk Break video. Of course, I should note that Busk Break is not strictly limited to buskers (we’ve covered open mics, and people playing music outside who weren’t asking for tips), musicians (puppeteers, balloon-animal makers, jugglers and poets have all been featured in the series), and it’s not limited to Asheville (although the city’s thriving street-music scene and the fact that I happen to live here tends means that the vast majority of the content as of 2012 is Asheville-centric). So, how did Busk Break begin? In late 2009, I was working on a hyperlocal media project in Spartanburg, SC, Spartanburg Spark. Since the start of that project, I’d been advocating for more locally produced multimedia content, but with limited response. So, not wanting to make a hypocrite of myself, I bought a Zoom H4n Handy Recorder with the intention of creating podcasts. With no background in audio production, I quickly realized that I needed to practice both recording and editing audio. Around that time, I was working as a blogger and forum/website admin for a few hours each week in Asheville, NC, for a small weekly publication called Mountain Xpress. Some of the earliest recordings for the series came from me testing my audio equipment on the local street performers when I made the monthly drive up the mountain to collect my paycheck. The Mountain Xpress was always in need of online content, and I began to post the audio recordings and photos on their site. They proved popular, and I decided that the series needed a name to tie it together. Trimming the phrase I was already using down a bit, I branded the series “Busk Break.” As they became more popular, I spent more and more of my free time recording buskers on the streets of Asheville. In early 2010, I decided to try my hand at incorporating video into the series. I’d bought a Kodak zi8 to record Spartanburg City Council meetings for the Spartanburg Spark project, and had slowly been teaching myself the basics of video editing. (And in the least user-friendly way, using the open-source Blender VSE method. It’s like learning to swim by practicing in a bathtub.) By mid-2010, Busk Break was a purely video project, and a regular feature on the Mountain Xpress site. In the summer of 2012, I moved the Busk Break project to its own site. I’d learned quite a lot about video and audio editing since the early days of the project, and it seemed like a good time to revisit the early videos in the series to see if they could be given a better treatment. Thankfully, I still had most of the original source files, many of which I’d filmed in HD, even though I’d compressed them for the standard-definition size common to online videos of the time.